These restaurants know how to handle their meats. (SPOT.ph) Where’s the beef? We’ll tell you where the beef is. Actually we’ll tell you where it’s not. It’s not in those cheap restaurants that fill you with such high school sizzling plate nostalgia. Or that gravy soup covered guck that you and your barkada love to share with your unli-rice. Those are ordinary steaks. What we’re talking about here is the BEST. This means you’ll have to spend for it. Educate yourself on a higher learning of choice meats. Discipline your trigger-happy gravy gun. These are the steaks for real men. So stop whining and start dining. You look at the menu and think the price is pretty manageable for steak, but every order at Stockton averages at 800 grams (that's approximately P3,960). 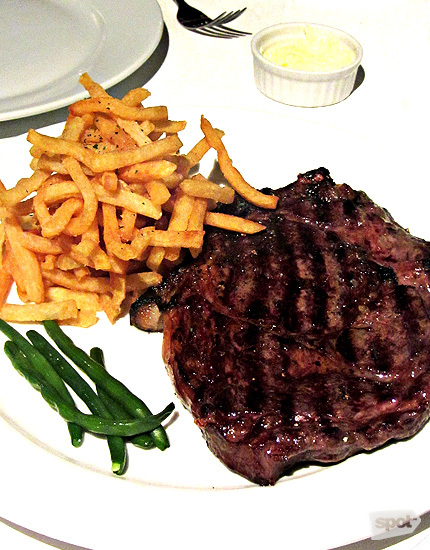 Chef Celine Escaler likes her steaks big and pink, so of course the lone rib eye is massive. There's not a lot of fat in there and you have some tough edges to eat through, but once you get to the rare part, your inner caveman will whoop in delight. The seasoning is light, but substantial, reinforcing all the right aspects of this not-so-marbled beef. Bordelaise sauce gives it a little pep. Is it just us or do those skin-on tater sides steal the show? Stockton Place is at 227 Salcedo corner Gamboa Street, Legazpi Village, Makati City (844-9539). Read more about Stockton Place. If you want to come in for steak, you have to be financially prepared. Smith carries four kinds of rib eye (among other cuts), with the U.S.A. Prime Angus, Grain Fed, Wet Aged 3 Days being most affordable. It's a hulking cut of meat, almost two inches thick and lean with some ligaments around the perimeter. Persevere because once you get past the chewy bits, it's full flavor ahead. This steak benefits from a rare to medium rare (Smith discourages cooking their steak well-done that they don't even give you that option) so you get a soft chewiness that emphasizes the very lightly seasoned meat. If you want extra succulence, get it with sauce. We're partial to the black truffle. Smith Butcher and Grill Room is at ACI Building, 147 H.V. Dela Costa Street, Salcedo Village, Makati City (0915-429-5167, 0927-375-9467). 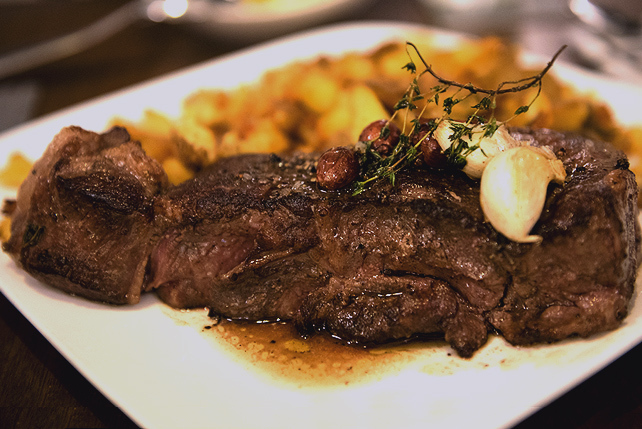 The family-owned restaurant may have slid under the radar over the years (Carmelo Santiago's children have their own steak shops now), but their steak definitely endures the test of time. They have several kinds, from Angus to different kinds of Wagyu (including some from the Wagyu Japanese Shop. See No. 4). The rib eye grade 7 to 8 is a reliable solution for a steak craving. They slice it in front of you so you can decide just how thick you want it. The marbling is exquisite and even all throughout so you get a good dose of beefy juiciness. If you're lucky, you get little globules of fat on the side that demonstrate a wonderfully charred flavor. We love it when they burst into salty, smoky juices. Take up the server's offer of gravy, but don't you dare insult the beef with it. Use it for your mashed potatoes instead. Melo's has branches at 58 Sergeant Esguerra Street, South Triangle, Quezon City; Forbes Town Center, Bonifacio Global City; and Westgate Center, Filinvest, Muntinlupa City. There’s a natural tendency to over order at La Cabrera. 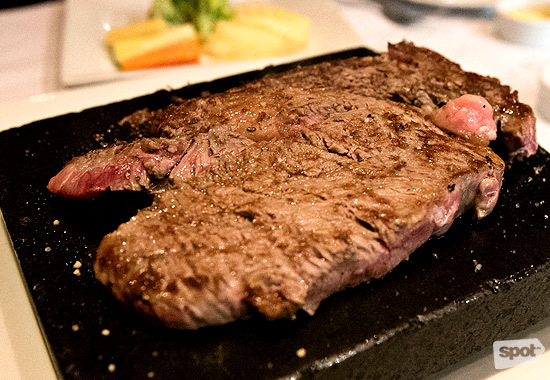 If it’s your first visit, take it from us: All you really need to order is the steak—the hefty 500-gram serving of Ojo de Bife (rib eye) is good enough to feed two hungry diners, especially since it comes with unlimited servings of sides (mushrooms, corn, baby potatoes, artichokes, and more). 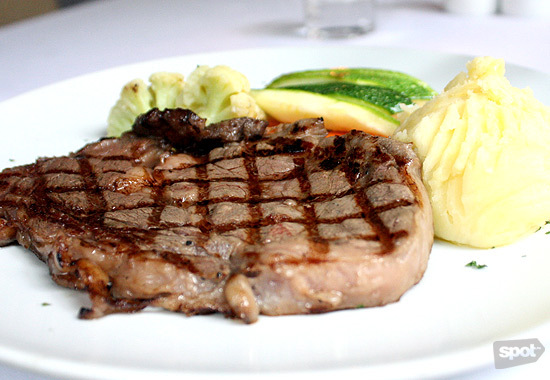 Cooked on a special charcoal grill, the steak (La Cabrera uses USDA Prime Grade beef) is imparted with a highly appetizing flavor while retaining its natural juices. Value for money? You bet. La Cabrera Manila is at 6750 Ayala Avenue, Makati City (0905-290-0703). Read more about La Cabrera Manila. 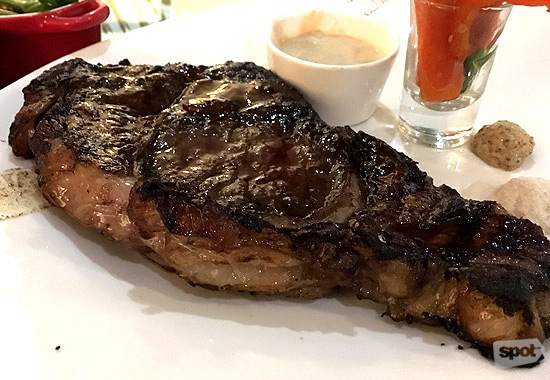 Once you get over the initial shock of dining inside a furniture showroom, the steaks at Prime 101 prove that there’s more to this restaurant than its novel location. 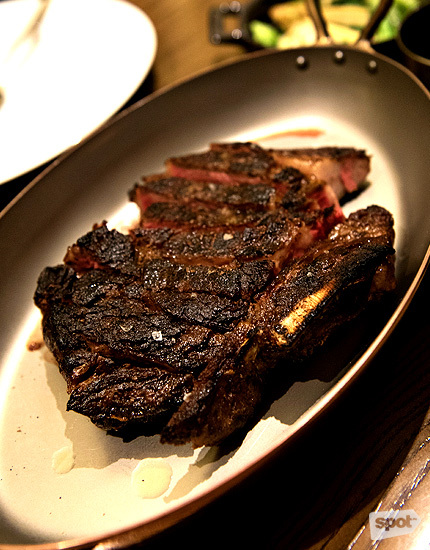 An impressive number of prime cuts is listed on the menu, including pricey Japanese Matsusaka and Kobe, as well as the Pinnacle grass-fed rib eye from Australia. The U.S. Prime rib eye sounds run-of-the-mill compared to these choices, but make no mistake, at Prime 101, it is a seriously satisfying piece of meat. Ask for it medium, with the center still pink and its juices running as you slice into the thick, nicely marbled slab. No sauce required. 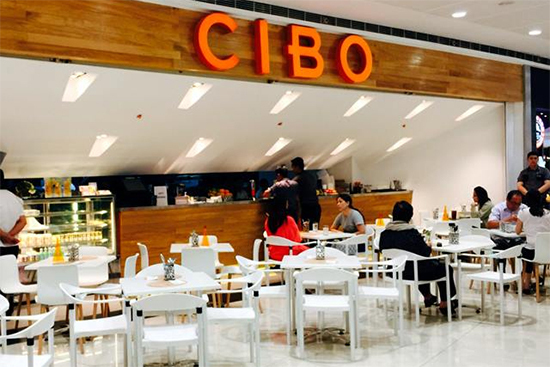 Prime 101 is at 2/F Ziebart Building, 2226 Chino Roces Avenue, Makati (720-8674). 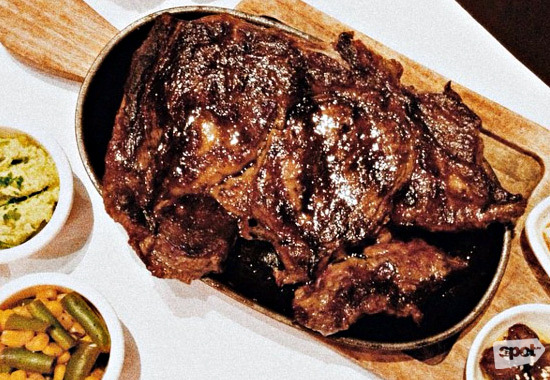 Chef Mark Tan has an Australian Blackmore rib eye that fetches for P2,400/100 grams, with each serving an average of 400 grams. You don't need to shell out that much. His Creekstone variety is already more than satisfying. With an average size of 600 grams, it's meant to be enjoyed by two people, and it comes complete with his legendary cheese and chorizo bread, a salad, soup, potato puree, and roasted vegetables. Fragrant charred fumes will assault you when the rib eye finally arrives at your table. The steak is seared at 1,300-degrees Celsius before it's left in the Josper oven where it absorbs fragrant smoke, intensifies flavor, keeps it moist. Those natural flavors are then lifted with a dash of salt (you can add more if you want, but we suggest the grainy mustard or none at all). The steak is mostly lean but incredibly juicy, with laces of bursting fat on the edges. Allium is at Grand Midori, Bolanos Street, Legazpi Village, Makati City. Read more about Allium. Melt in your mouth. These four words often describe chocolates or creamy biscuits. And in the case of the beef—anything you order—at this restaurant, the four pieces of Wagyu beef that we stared at hungrily. It's very lightly seasoned to showcase all that marbling, but if you need to give it some edge, just sprinkle any of their yuzu, plum, or pepper salts. It is a bit pricey considering the size of the slices. But trust us when we say that when you slide these into your eager mouth, you will have a sudden hankering for more. 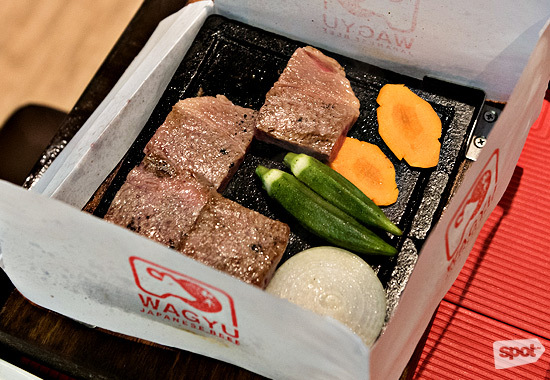 That’s the danger when you’re dining at Wagyu Japanese Beef, these wondrous slices of Wagyu are addictive. Our recommendation, order the rib eye as a starter to get a ton of flavor and then end with the steamed Sirloin (plus steak rice!) to seal the deal and your palate. Wagyu Japanese Beef is at G-20 Sunvar Plaza Building, Amorsolo Street corner Pasay Road, Makati City (0922-808-9508, 0919-997-0711). 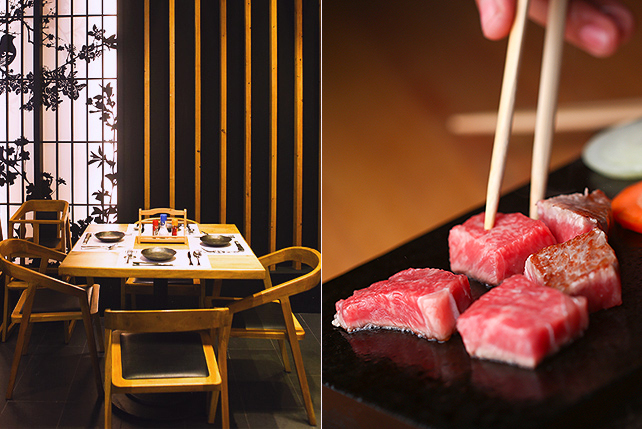 Read more about Wagyu Japanese Beef. The chef tells us that it's just good salt that they use to season their meat. Salt and nothing else. They're that confident of its flavor. It's a pretty warranted #humblebrag. The steak is served cooking on a stone grill so you get a measure of how well you want it. The marbling speaks for the quality of House of Wagyu. Even when you enjoy it well done, it's still so perfectly succulent. The fat just disappears into buttery savoriness. The entire serving is tender all throughout so you won't really feel the weight of all that cow. Steaks at House of Wagyu automatically come as a set with salad and soup and terrific service. Is dining at Elbert’s Steak Room an ultimate dining experience? The answer is yes. The place is beautiful. The mood is private. And the steak is indeed excellent. They start you off with the soup of the day and a house salad. There’s even a wide choice of side dishes. But we all know it’s the steak that’s the hero of the night. And as soon as it arrives, all you need is your steak knife, your fork, and a dash of salt. This is a complete steak experience. Sure, the price tag may be a bit high. 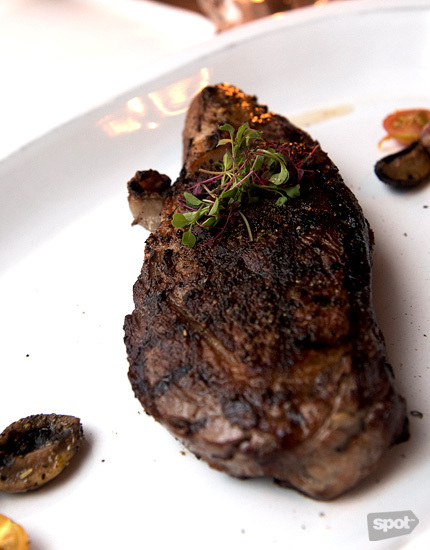 But if there’s one thing you should treat yourself out to, it’s a juicy, delicious steak at Elbert’s Steak Room. Ask them to hold the salt so you can taste the meat better. Elbert’s Steak Room is at 3/F Sagittarius Building III, 111 H.V. De La Costa Street, Salcedo Village, Makati City (519-8665). When a steak has a name that long, you know it has to be damn good. In fact, Mamou’s steak is damn freakin’ delicious. The sear of the steak is incredible, giving it a good crusty and not-too-salty exterior that just makes you want to bite even harder into this delicious, and juicy slab. There’s a bit of pan juice oozing out from the meat, but not enough to make you cringe. 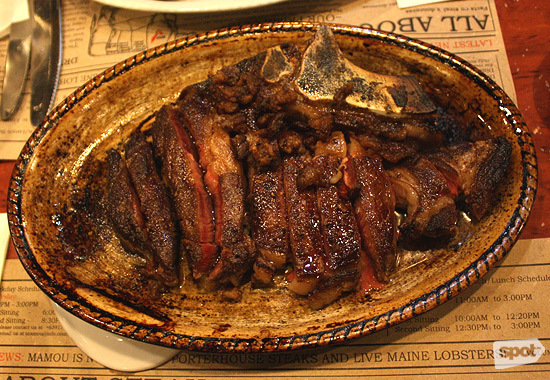 In fact, Mamou highlights it like an extra sauce. They serve their steaks tilted so all the amazing jus slides down to one side. And because you can never get enough meaty goodness, the kitchen rewards their steaks by topping them with the cracklings that broke off and crisped up as the slab was cooking. We recommend that you get the red steak rice and the mashed potatoes to go along this monster piece of meat, as well as ignore the gravy and use the sea salt instead. Sprinkle a little bit and enjoy the explosion of flavor. 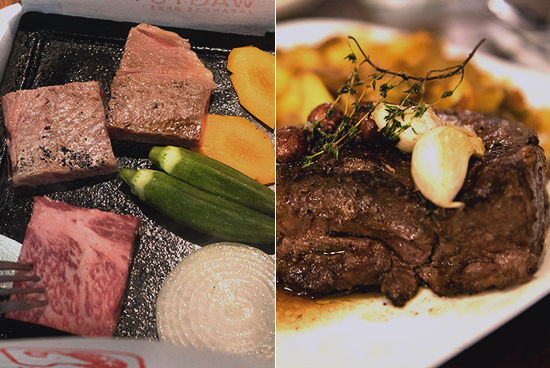 Mamou has branches at G/F Serendra, Bonifacio Global City (856-3569, 909-5741); and G/F Power Plant Mall, Rockwell, Makati City. 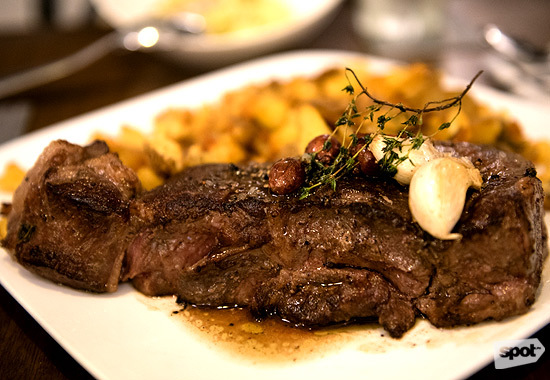 Don't get your wallets in a twist, we are currently updating Top 10 Steaks Under P500 (2014 Edition).